Anyone can improve their English Pronunciation! There are many benefits to improving your English pronunciation including: increased self confidence, improved communication with clients and colleagues, more job opportunities, not having to repeat yourself constantly, and having others gain more trust and confidence in you. 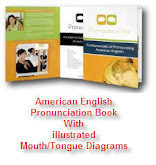 You probably know why it is important to develop your American English pronunciation and you may have tried in the past. Maybe you made some progress, maybe you didn’t. No matter what your current level or past experiences, you can make progress. You may never sound exactly like a native, but that is not what English pronunciation lessons are about. You want to be understood so that you can communicate effectively. It is okay to have an accent, it makes you unique, but you do need to pronounce English words properly and you can achieve this goal. Anyone can improve their English pronunciation if they follow several important steps. First you need to have realistic expectations. Second, you should set measurable and achievable goals. Next, find a proven English pronunciation guide or study program to follow. Last, you need hard work and to be consistent in your efforts. Having realistic expectations is important in learning any foreign language. Many of us think that because we are adults we should be able to learn a foreign language and master it quickly. Languages are subtle and organic systems that take time to develop. We do not master our own native language until we are into adulthood and many still struggle then. You can master a foreign language. If you have realistic expectations, you will make measured progress towards improving your English pronunciation and speaking. Setting goals is the next step to success. Evaluate yourself and be honest. What do you need to work on and what is most important? You may not know what you need to work on and may need the help of an English tutor or English pronunciation guide to help you figure that out. Ask your tutor, or on your own, list your pronunciation problems. Now choose the ones that are easiest to fix and start with those. Then slowly start working on the harder ones and make several small goals that will help you achieve your larger goal or harder problems. This next step could be the most critical in your English language development. The most important decision is finding the right program to follow. Choose a program that is well rounded, covers every part of English pronunciation, and gives you plenty of visual aids, exercises, and audio training to help you mimic the sounds of proper pronunciation. If you choose the right program, like PronouncePro, you will be one step away from English success. The last step is you. You must work regularly and diligently to improve your American accent. Apply the things that you are learning and be disciplined. If you follow these simple steps, you will be successful in improving your English pronunciation. You will be more confident, happy and successful because you are able to better communicate with others. Be realistic, set goals, find a good pronunciation guide, and most importantly work hard and you will succeed.